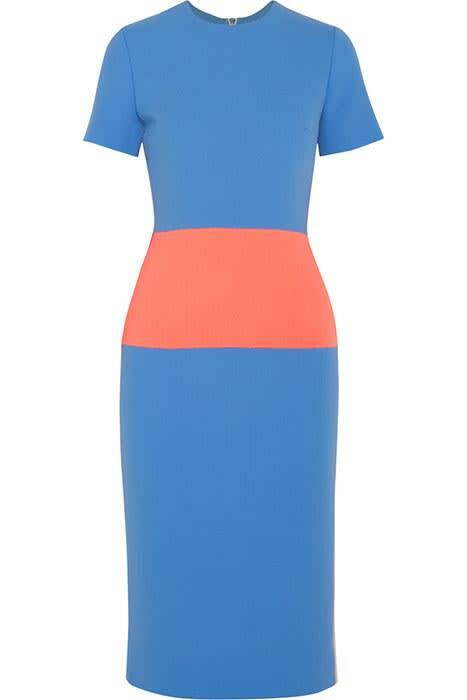 Kate Middleton dazzles in discounted colourblock dress | HELLO! The Duchess of Cambridge is known for her love of a fashion bargain, often championing high street brands and showing off her sale purchases – she’s a regular shopper at outlet centre Bicester Village. And Sunday’s appearance was no different; the royal dazzled in a hugely discounted colourblock dress from Roksanda Ilincic. The dress features on outlet online store TheOutnet.com, and has been reduced from £980 to £490, a staggering 50 per cent discount! Kate is a fan of the London-based designer, who shows at London Fashion Week, having sported her designs on several occasions. The royal is having a very fashon-forward weekend as she joins in the Queen’s 90th birthday celebrations. On Saturday, Kate recycled a white Alexander McQueen coat that she previously wore to her daughter Princess Charlotte’s christening. She paired the pristine coat with a stunning new headpiece by milliner Philip Treacy. Tilted and featuring floral detailing, the headgear looked beautiful on the pretty brunette. Her two children, meanwhile, looked just as fashionable. Prince George had borrowed an old outfit of his dad’s for the occasion, wearing the same little ensemble Prince William wore to Prince Harry’s christening in 1984. Princess Charlotte was pretty in pink, wearing a cute embroidered dress with a matching Amaia Kids bows in her hair and her trusty Mary Janes from Early Days.